Established in 1990 by British designer Peter Bowles, Original BTC draw inspiration from Britain’s rich post-industrial history as well as incorporating modern tastes and trends with very latest innovative designs. All lights are handmade and manufactured in the UK. These are created by using the best quality raw materials to their upmost capability, paying great attention to the concept and form. 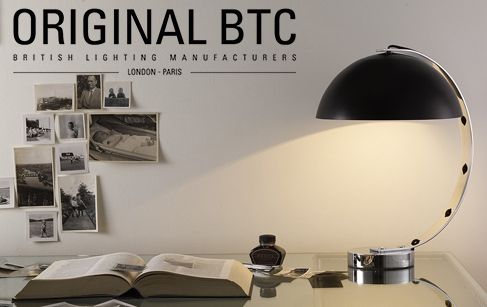 Original BTC’s Birmingham based factory hand-forms, presses and stamps aluminium, copper and brass shades and bases from their original sheet metal state. The staff are craftspeople able to solder, weld and form to exacting standards. Based in the heart of the country’s metal-working industry, the highly skilled workforce use centuries old techniques. Glass is mouth-blown using highly skilled labour and the time-intensive process resulting in glass of the finest colour, clarity and brilliance. Unlike homogenous mould-made glass, each piece is unique, with slight variations demonstrating the care and attention with which it is crafted. For over three centuries, Stoke-on-Trent has been famed for its bone china tableware. Fascinated by the area’s rich industrial history, Original BTC set out to create a collection of Stoke-made bone china lights. Skill and expertise helped create a beautifully crafted collection of hand-cast translucent and versatile bone china shades. Quality, detail, interesting mix of materials, cotton braided cables, satin chromed bases and contrasting coloured shades make Original BTC’s products definitely unique and popular in Europe and beyond.